In my experience, novels that are considered epistolary, experimental, or dystopian have a good chance of being pretentious self-indulgence and/or derivative drivel. 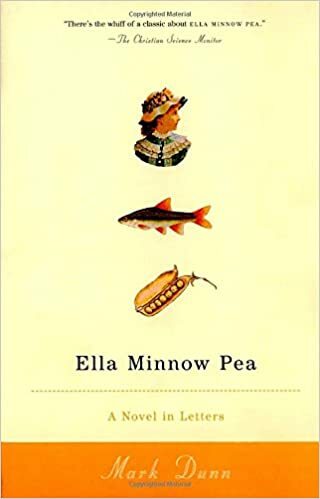 Ella Minnow Pea delightfully combines all three of these into a whimsical dystopia (who knew there was such a thing?). The small island nation of Nollop is most famous for being the home of Nevin Nollop, the man who came up with the pangram The quick brown fox jumps over the lazy dog. When a letters falls off of the monument to the miraculous sentence, the ruling council outlaws its use in spoken or written language…and other letters soon follow. This is obviously the will of Nevin Nollop speaking from beyond the grave, and those who break the law face dire consequences! These absurd decrees and their effects upon society are discussed and reflected in the letters (as in epistles) that comprise the novel. The letters are to and from the 18-year old Ella Minnow Pea and her family and friends. The author’s skill in avoiding more and more letters (of the alphabet) as he writes is truly impressive. The one complaint I have about the novel is that, in the beginning, the characters all have nearly the same voice and vocabulary, making it hard to tell them apart. The story as a whole serves as a nice commentary on censorship, totalitarian government, and speculation-based but fanatical ideology. Unlike most dystopias, this book is mostly light, hopeful, and just a little bit silly. It is currently my favorite fiction of the year, and you should go read it if you haven’t. In other news, the reason I haven’t posted anything in longer than usual (and I know I’m already pretty sporadic) is that I’ve been up in Michigan interviewing for a new job, and things are looking very positive. There are still a few hoops to jump through, but there is a very good chance that within a month or two we’ll be moving to somewhere closer to family, better for my wife’s health, and more financially stable! Hey, that last paragraph is great news. Will be praying that the right thing works out. I love this book so much. Good luck with the job! Wow I never would have thought whimsical dystopia could be a thing- but this sounds brilliant. Great review! Good luck with the job! You’re welcome! Oh good luck! That makes sense.